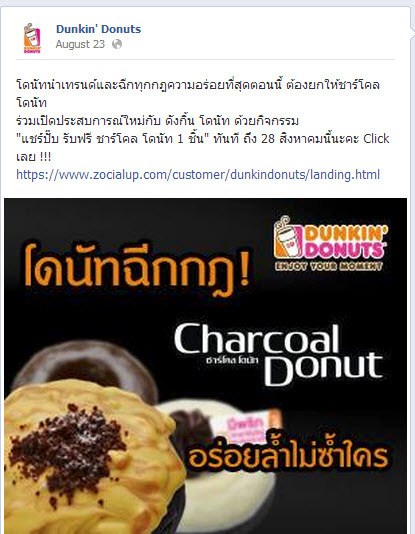 On Aug 15, 2013, Dunkin’ Donuts Thailand held a campaign on their facebook fan page offering free charcoal donuts. 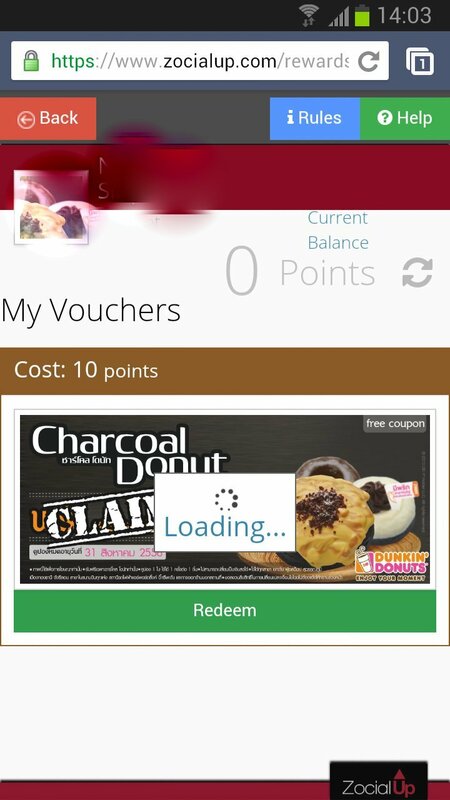 In order to receive free donut, one must follow the link provided seems to be a third party provider named zocialup.com that uses your facebook account to generate scores based on the activities or events set. 1. Customer must have a facebook account. 2. Customer must like the https://www.facebook.com/DunkinDonutsThai page to generate scores. 3. Customer must redeem coupon first, 10,000 coupons limited. 4. Customer must claim coupon at shop using smartphones, tablets with internet connection – erm? why can’t you accept prints? 5. Shops will have to key-in valid store number on the pop-up page to have successful transaction ? What happens if? The clerk just happens to be new, or doesn’t know the store number? What if the pop-up doesn’t pop-up? Zocialup.com server suddenly shuts down? My personal experience as an average tech geek, spent around 30 minutes trying to figure all the above 4 points by following up on their facebook, which was slow and fraction, When trying to reclaim the coupon at the shop during the weekend, the zocialup.com server decided to stop working and gave no response, a terrible disappointment from Dunkin’ Donuts (Thailand) and Zocialup.com. Considered this as a Social and Internet marketing lessons learnt here. Dunkin’ Donuts (Thailand)’s first social marketing campaign completely failed, my feeling towards the brand went down the drain, when compared to Mister Donut and Daddy dough, whom chooses to join forces with Samsung’s Galaxy Gift application offering better and efficient social marketing campaign. Zocialup.com’s hasn’t educated the market with it’s campaign workflow. Zocialup’s application engineer should understand that social market should be kept simple and easy enough to be viral, unlike business processes. Even the website of http://www.dunkindonuts.co.th/ isn’t even up allow customers to view this campaign’s detail, leaving it all to third party provider like Zocialup.com, shows how incompetent the CIO of Dunkin’ Donuts (Thailand) is. Again, a nice gathering among Chem Eng friends. A total of 7 friends joined, including Art, Tui, Ta, me, Art, Tom and Wish. Conversation topics covers from updates of each other, projects, topics of interest e.g. renew energy, society and politics. · Art still works at Mitrpol, single. · Tui running his own company. · Tom still works at RSB. · Wish runs his own ranch at Kao Yai.